Wednesday night was the 9th race in the Summer Sunstroke Stampede in Brushy Creek Park here in Austin. There were a lot of things going on this week that made the race a little more “serious” than in previous weeks as members of our office here in Austin were racing with me as part of the “Get Buff at the Ruff Challenge”. Our Company name is RuffaloCODY – hence the title to our challenge. The rules were simple – I needed to complete the 5K course in less than half the time of the final finisher from our office to win. If they were all able to finish the course in less than twice my race time – they would claim victory. A win for the team would mean an outing on Lake Travis here in Austin for their group paid for by the loser – me. A victory for me would mean the office staff paying my entry to the Austin Marathon and coming to cheer me on at the race in February. I knew going into the race that “winning” the above wager was highly unlikely. In fact, I was rooting for my guys to come well under my adjusted time and earn the day on the lake. That is not to say that I did not have a goal for Wednesday night as it was a race day afterall. And that goal was taking on my friendly rival in the Male Masters Division – Bill Schroeder. Bill is a fantastic runner here in Austin and actually serves as a coach to many in the area. In the first two Summer Sunstroke Stampede Races that I participated in on the Brushy Creek Trail, Bill got the better of me both times and won the Male Masters Division. I made some strides in my second race dropping my time from 20:23 to 19:45 and finishing only :18 seconds behind Bill. The key in that race was getting out fast over the first two miles and then powering up the hill that stretches over mile three to the top of the dam. I was able to close within a few strides of Bill on the hill, but he was able to pull away from me on top to claim another victory. My strategy was to push the first two miles even harder this week, keeping in contact with Bill to the bottom of the hill and then taking him on the climb if I could. It would only be .50 miles to the finish at that point – if I was able to get a lead, I was hoping that I had enough left to hang on at the end. Starting Line: I settled in to my starting area about 10 runners from the front and glanced back at the staff members from our office. They were 20-30 runners behind me, laughing and smiling – looking very confident. Standing next to Bill I shook his hand and asked if he was planning on “going fast” today. He smiled and said “going under 19:30 would be a good time tonight”, I told him that was a fast time in my book and filed it away before the start. With a PR of 19:28, I was going to be in for a fight if I wanted to run a sub 19:30 time on a hilly course with a race temperature of more than 90 degrees. But that’s why you run the race …. Mile 1: We took off at the start and like the first two races I fell into a quick pace and found myself once again 10 yards or so behind Bill. “Man, is this guy tough” I thought. Wind was blowing from the North on Wednesday night, which made the first 3/4 of a mile into the wind. I had a runner drafting behind me, stride for stride letting me break the wind for him, but I was not able to cozy up to anyone to do the same thing. I was on my own, once again chasing Bill. I pushed the pace a bit harder than two weeks ago and as we neared the first mile marker on the dam I glanced down at my watch on the beep – 6:02 for the first mile. :04 seconds faster than my last race on this course and a bit closer to Mr. Schroeder. Mile 2: I focused on my breathing on mile 2 and I have to admit, I wasn’t feeling so great. The combination of the faster pace, running into the wind and “chasing” had me working hard. I was determined to try to keep steady at 6:15 pace over the second mile, which would give me “a fighting chance” at a 19:30 with the climb up to the top of the dam on mile 3. I made the turn at the turnaround point, grabbed my cup of water, took a quick sip and dumped the rest over my head and down the back of my neck. The water felt great …. my legs …. not so much. I glanced down at my watch on the beep for mile two and had posted a 6:14 split. Right on target, now it was time to climb. Mile 3: I made my way across the footbridge and shook out my arms, I was going to need them to hold a quick pace up the 6/10 of a mile climb to the top. I looked up ahead and spotted Bill about 10 yards ahead of me. There is a great advantage being the “chaser” instead of the “chasee” as I knew exactly how fast I needed to go to catch him. Bill was steadily climbing but moving at a slower pace than I was, this was my chance. I pulled even with Bill about half-way up the incline and felt his pace quicken a bit next to me, I pushed a little harder and was able to work in front of him for a few strides, then tucked in ahead. Running up the crushed granite trail I could hear Bills footfall behind me, I was hoping to keep pushing up the hill and build a bit of a cushion so that I would be able to hold on over the flat portion of the race across the dam to the finish. As I left the granite onto the cement ramp that takes runners to the top of the dam I was able to get a quick glimpse behind me as the ramp switched back 90 degrees in the middle. I had opened up what looked like a :10-:12 second lead and was determined to hold onto it. My legs and lungs were really burning across the dam, but I did not hear any footsteps following me. I glanced down at my watch at the mile three mark and had turned in a time of 6:28 – only .10 miles to go. Finish: The final .10 of a mile was tough as I had been running “in front” for the better part of 3-4 minutes. For me it is much tougher to keep pushing my pace without “chasing” anyone in front of me as all of the really fast runners had long since pulled away. I just concentrated on my stride, tried to run “tall” and even out my breathing to post a strong final tenth of a mile. Final time 19:29 – only :01 from my PR set a few weeks ago at the Holland, TX 5K – which was a morning race on a much more forgiving course. Not much to be disappointed about there. Bill came in behind me at 19:44. Pushing me to a great time for me and almost my second PR this month. Thank you Bill! Here’s the bad news – Osmani Hofstatter – who I had not seen at any of the previous races in the series posted an incredible 17:07 at the age of 40. @#$%! Are you kidding me? That is the great part about racing. In the end, you are really only racing against yourself. I was more than happy with my time – and I was able to exorcise at least one “demon” along the way. Another loss for Joe on this night. Even that blistering 17:07 would have proven to be too slow to take down the staff. I am so proud of the group as they hung together and got it done – I think they even had a little bit of fun racing last night, although I don’t expect them to admit it …. who knows what kind of craziness I would put them through the next time if they did. After the quick “awards ceremony” the group and their significant others made it over to our place for a late-night barbeque – which was a great way to wrap things up. Now it is time to take it easy a bit over the next week or so as we will be taking our first crack at the 10K distance next Thursday night in the Honor our Heroes 10K Shadow Run at 9:30 p.m. on July 15th. I’m looking forward to racing in the series again in a couple of weeks, I don’t think I will be able to sneak up on Bill next time. As for Mr. Hofstatter, as long as he is racing, I’ll just have to keep chasing after my 19:28. 17:07? That’s FAST! 17 flipping’ 07! Out of my league, that guy was moving. Great race Joe. Good luck next Thursday. Trey – 17:07 is unreal! 5:29 pace in 90 degree temps on a tough course …. that’s almost not even the same sport for you and I. The winner finished in 16:12 – 5:12 pace, he’s an 18 year old runner on the Michigan track team …. I can live with that one. But the 17:07 at age 40 —- that’s FAST! Hi Connie! Thanks for the visit and the message! Dawn is doing great, just 8 more weeks until “baby-time”! Hope you are having a great summer – stay cool up there! Well crikey Joe, you run like that when it is cooler and you are knock knock knocking on 18’s door. Way to RLH! Richard! Greetings from out here in Austin – I am thinking about CRBR almost on a daily basis right now – shooting for that sub 40:00 qualifying time to run “up front” with the “fast” folks – hoping I can get there this fall. 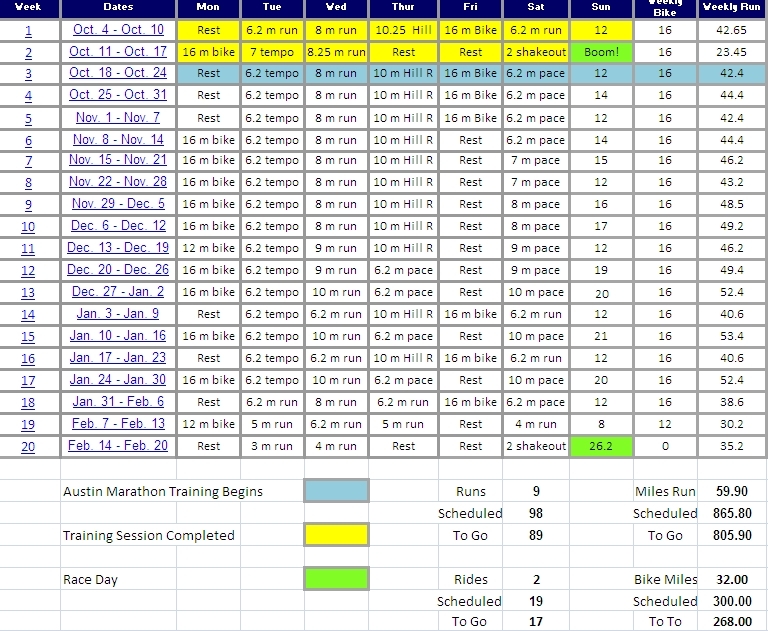 Interesting that I’m more fixated on that race right now than my next full marathon here in February …. maybe I just need to “go fast” for awhile right now. I think fast, shorter races build a lot of confidence for the marathon. I love doing 5ks, you get all the elements of racing and they don’t tear you down so much that you can’t do them often even as speedwork. I think you will get there with your dedication and talent, when you have both of those things going for you there’s not much that can stand in the way of your goal. Great job out there and wow 17:07 is just smokin’! That guy is home on the couch by the time I finish! You have to admit it is nice to accept defeat when it involves helping others realize the importance of health and wellness. So, I am guessing the loss to the office was bittersweet! Great things you are doing out there, great things! Hi Jodi! Thanks so much for the visit. Yeah, that guy is playing a different sport throwing down a 17:07, that is just crazy fast. 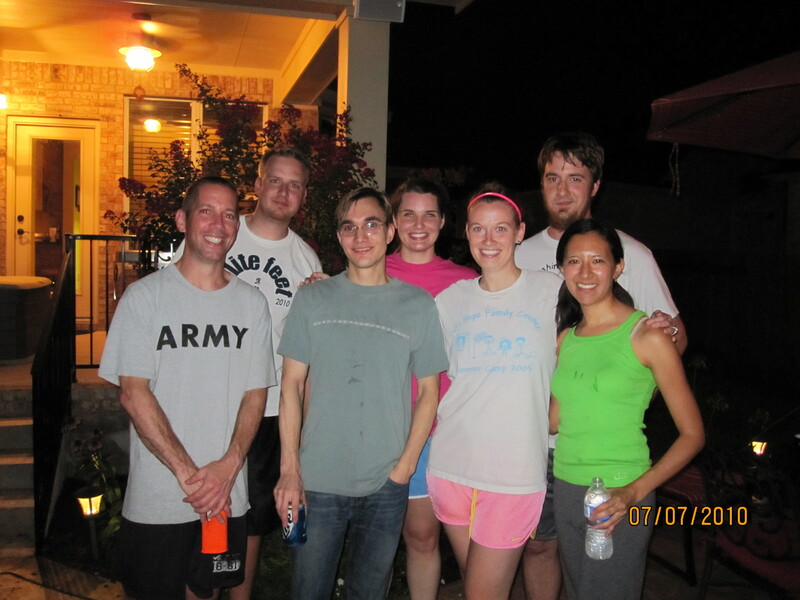 It really was a lot of fun and you have it exactly right – it was great to get everyone from the office involved and the running bug is a funny thing – you never know who and when it is going to bite. Greetings from Cancun, MX – It’s Race Week!